Caption: (center right) Rocky Ridge Lake. 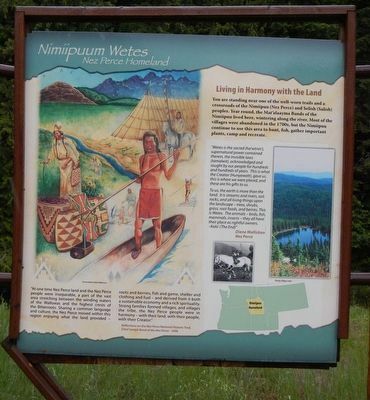 You are standing near one of the well-worn trails and a crossroads of the Nimiipuu (Nez Perce) and Selish (Salish) peoples. Year round, the Mat’alaayma Bands of the Nimiipuu lived here, wintering along the river. Most of the villages were abandoned in the 1700s, but the Nimiipuu continue to use this area to hunt, fish, gather important plants, camp and recreate. “Wetes is the sacred (ha’wtnin’), supernatural power contained therein, the invisible laws (tamalwit), acknowledged and sought by our people for hundreds and hundreds of years. This is what the Creator (Hunyawatt), gave us, this is where we were placed, and these are his gifts to us. The marker is at the center. 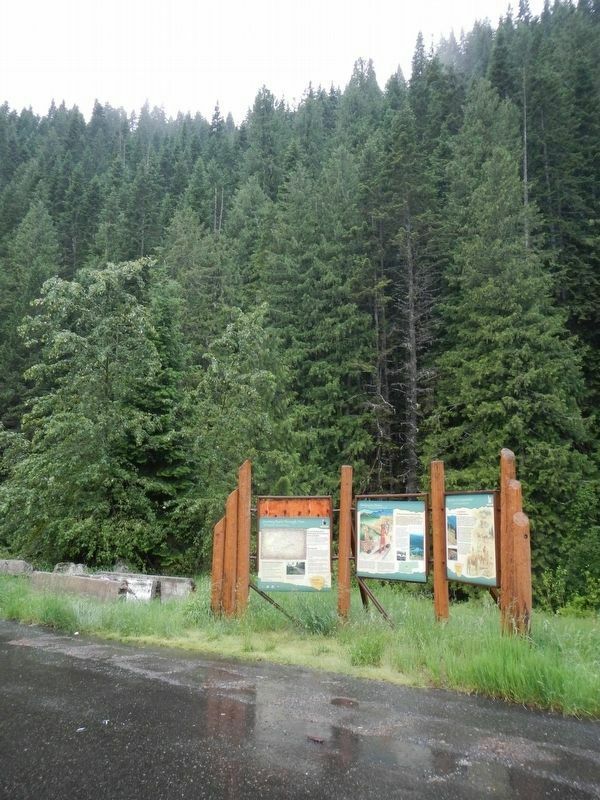 Erected by U.S. Forest Service, Clearwater National Forest. Location. 46° 27.036′ N, 115° 5.046′ W. Marker is near Kooskia, Idaho, in Idaho County. Marker is on U.S. 12 at milepost 140 near Gravey Creek/Saddle Camp Road (Forest Road 107), on the right when traveling west. Touch for map. Marker is in this post office area: Kooskia ID 83539, United States of America. Touch for directions. Other nearby markers. At least 2 other markers are within 7 miles of this marker, measured as the crow flies. My Name is K'useynisskit (here, next to this marker); Welcome to Colgate Licks (approx. 6.9 miles away). More. Search the internet for Nimiipuum Wetes. Credits. This page was last revised on September 11, 2018. This page originally submitted on September 11, 2018, by Barry Swackhamer of San Jose, California. This page has been viewed 45 times since then and 7 times this year. Photos: 1, 2. submitted on September 11, 2018, by Barry Swackhamer of San Jose, California.